Bicycle Repair Forums - BikeRide › Maintenance & Repair › General Questions › Derailleur adjustment. Have I got this right. Turning the high or low screws counter clock wise increases the amount of travel of the derailleur mechanism on both the front and back? and turning them clock wise decrease travel? Is this the easiest way to think about it? One other thing I have noticed when replacing both brake and derailleur cables is the new thinner stainless steel cables run much smoother in the Jagwire then the thicker ones they sell do and are much easier to thread through grip shifters etc. as the cable ends seem to be treated so they do not unravel or fray. Well worth the extra dollar I think. My clocks are digital, but the screws are "righty tighty and lefty loosey". The only time you tinker with these screws are when setting them during a cable replacement or a tune up. the rear low limit screw should be set so the idler pulley is directly underneath the cog. If friction shifting in the rear, the high limit screw should be set directly under the smallest cog. If indexed rear shifting, the high limit screw should be set slightly off center so the idler pulley just towards the outside center of the cog. 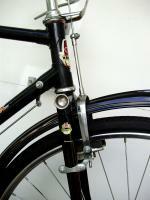 (1mm) The front low screw should be set .5 to 1mm from the chain while in the lowest gear in the rear. the high limit screw should be open enough to allow shifting to the largest ring without chain throw towards the outside. then set the front high so there is no chain rub and indexing correctly without rub. all settings are done without the cable connected. and are merely starting points. however the high limit in the front can be set without affecting cable slack, it only limits cable throw/pull. After setup if you shift the rear and move two gears your high limit is set wrong, if does not move one gear, your limit screw could be set wrong or you have cable slack. Ideally you would move one gear, shift to the next gear, whether it shifts to it or not, then adjust the barrel adjuster until it starts to clang to the third gear, then back 1/4 turn til the clang stops. Now run thru the gears to see how the do and make any proper barrel adjustment from there. Again before any of this is performed, you must make sure the front derailleur is properly aligned, and just as important to make sure the rear hanger is properly aligned. (04-18-2015, 03:34 PM)painkiller Wrote: My clocks are digital, but the screws are "righty tighty and lefty loosey". The only time you tinker with these screws are when setting them during a cable replacement or a tune up. the rear low limit screw should be set so the idler pulley is directly underneath the cog. If friction shifting in the rear, the high limit screw should be set directly under the smallest cog. If indexed rear shifting, the high limit screw should be set slightly off center so the idler pulley just towards the outside center of the cog. (1mm) The front low screw should be set .5 to 1mm from the chain while in the lowest gear in the rear. the high limit screw should be open enough to allow shifting to the largest ring without chain throw towards the outside. then set the front high so there is no chain rub and indexing correctly without rub. all settings are done without the cable connected. and are merely starting points. however the high limit in the front can be set without affecting cable slack, it only limits cable throw/pull. After setup if you shift the rear and move two gears your high limit is set wrong, if does not move one gear, your limit screw could be set wrong or you have cable slack. Ideally you would move one gear, shift to the next gear, whether it shifts to it or not, then adjust the barrel adjuster until it starts to clang to the third gear, then back 1/4 turn til the clang stops. Thanks PK. I'll run you info through my grey matter. (04-18-2015, 03:08 PM)elmore leonard Wrote: Have I got this right. Turning the high or low screws counter clock wise increases the amount of travel of the derailleur mechanism on both the front and back? and turning them clock wise decrease travel? Is this the easiest way to think about it? This is almost always true on the front derailleur and usually true on rears. But not always. Some derailleurs have the limit screws hitting different parts of the mechanism and the reverse will be true. Some rear derailleur's with the spring relaxed actually start with the large cog in back. Still the low limit screw, still low gear. Shimano c101 rear derailleur is an example of this.